If you’re interested in exploring the valley but don’t know where to go, you might like to join one of our regular guided walks. 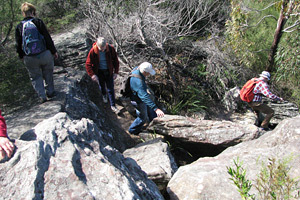 Various members of the Wolli Creek Preservation Society lead walks with commentary though different parts of the valley. Some walks cover short sections, while others extend the full length of the valley. Some walks cater to particular interests, such as birdwatching. All the walks introduce you to wonderful areas and give you the opportunity to learn about changes to the valley and current issues affecting its viability and survival. Come and share our local knowledge and become one of those ‘in the know’ about this hidden gem. For example, did you know that the valley has a small stand of rainforest at the Western end and a Fish Ladder in the weir at Turrella Reserve? The walks run along easy bush tracks and over grassy parkland, with no steep sections, unless you want to make your way up Nannygoat Hill for the fantastic views. We conduct walks 5 to 6 times a year. Contact info@wollicreek.org.au for details and dates. Also check our calendar for upcoming walks. If you want to walk on your own, see the map associated with the Two Valley Trail. 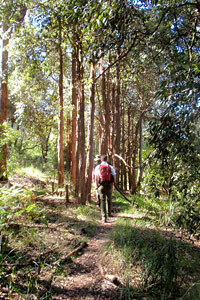 Since the Two Valley Trail was opened in June 2008, there has been a massive upsurge in walkers using the Wolli Track through the Wolli bushland. Walking groups and individuals right across Sydney, and even further afield, have discovered the Trail, a thirteen kilometre walk from Campsie to Bexley North via the valleys of the Cooks River and Wolli Creek.